$7 for a $20 Gift Certificate to Great Harvest Bread Co.!! 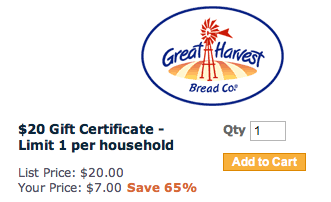 Right now at City Deals you can get a $20 Gift Certificate to Great Harvest for $7!!!! Amazing!! The certificates are for only 3 locations: Draper, Taylorsville, and Holladay. I can't imagine these lasting long. Use code TSEARSCB for FREE shipping!! They've also started a Deals Outlet! Check that out to find some more great deals. 70 - 90% off!! Also remember the giveaway: 2 winners get $20 City Deals Gift Certificates! got it! Thanks! The free shipping code didn't work for me though. Thanks! I love your site. Here's how I used the last certificate we got for $10 from citydeals. I picked up a $15 gift set (jam, honey, spreader, and loaf of bread coupon) and then a loaf of bread. My total was 20.90. I took the coupon for a loaf of bread out of the gift pack and kept it, took the gift pack with the loaf I bought as a gift. I can now use the coupon for a loaf any time I want. (The $20 has to be spent in one transaction - I usually don't need $20 of bread in one transaction, but this scenario works for me. It's a great gift for $7 and you get a loaf of bread for later with the coupon). That's a great idea!! Thanks for sharing! !